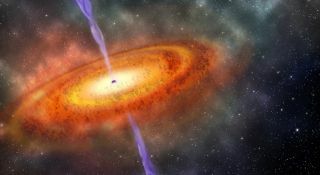 Artist’s illustration of the most-distant supermassive black hole ever discovered, which is part of a quasar from just 690 million years after the Big Bang. Astronomers have discovered the oldest supermassive black hole ever found — a behemoth that grew to 800 million times the mass of the sun when the universe was just 5 percent of its current age, a new study finds. Astronomers can detect quasars from the farthest corners of the cosmos, making quasars among the most distant objects known. The farthest quasars are also the earliest known quasars — the more distant one is, the more time its light took to reach Earth. "All that mass — almost 1 billion times the mass of the sun — needs to be gathered in less than 690 million years," Bañados said. "That is extremely difficult to achieve and is something that theorists will need to explain in their models." Artist’s rendering of the discovery of the most-distant quasar known. It is surrounded by neutral hydrogen, indicating that it is from the period called the epoch of reionization, when the universe's first light sources turned on.